I realized this morning I haven't shared my birthday prezzies from last month. Quite a haul, I assure you! 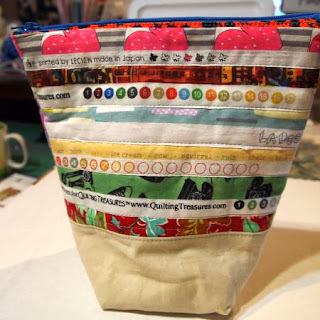 An original "i make UgLy Bags" by itsnursejessi. Notice the wine bottle on this side? Does she know me, or what? 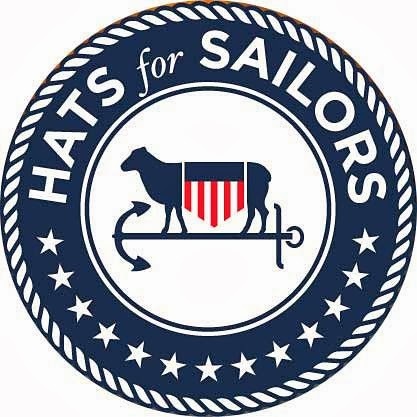 I immediately loaded it up with my current Hats for Sailors project, and it's been by my side ever since! Inside was this charming collection of shot cottons. I have been having so much fun stacking and re-stacking them, I may never use them! Jessi, you are the best! 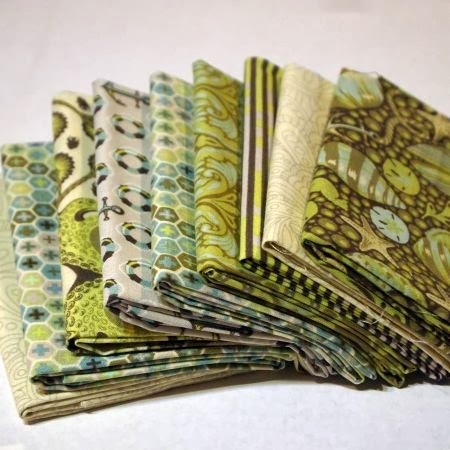 Those green fabrics on the left-hand side are from Tula Pink's "Saltwater" collection. Since this is my 400th post, as well as my birthday, I think I should give those away. 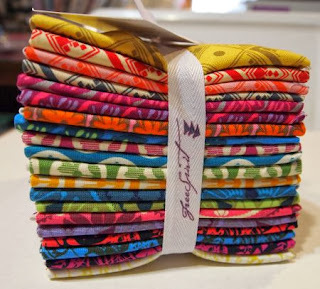 And also a copy of Tula's book, Quilts from the House of Tula Pink. Comment on this post, and tell me your favorite birthday gift you ever received. Next Saturday, I'll let the random number generator choose a winner to receive the fat quarters and the book. Giveaway ends at midnight MDT on Friday, November 29. If you're a no-reply commenter, please be sure to include contact information. 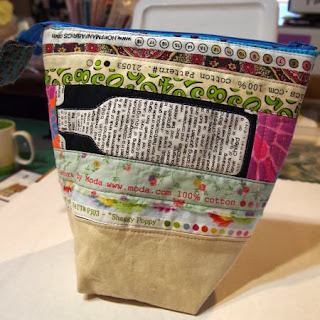 Linking up to "Sunday Stash" at Finding Fifth. Thank you to all 52 Quilts followers! Best gift so far...high tea with my then boyfriend, now husband. In the works for my 40th, some international travel. I love that bag! Wow, I am hoping I'll get the best birthday gift ever THIS year in a week or so, lol . . . my sister gave me a small gold bracelet for my 50th and I was so touched by the thought, so I guess that would be it so far. My favorite Bday gift was a 1/4 pound bag of Civet Coffee (cat poop coffee) that all my friends put money towards to buy for me. It was the most awesome tasting, mild, aromatic coffee I have ever had. I have to say...it was my favorite and if it wasn't the most expensive coffee in the world, it would be what I drink on regular basis! It's a very fond memory, both the act of them all coming together to purchase it and the flavor. My best birthday gift is my latest great nephew Connor - born on my birthday just 2 months ago! Green's my favorite color. Thanks for the chance to win. Many years ago when I lived in Chicago there were suitcase parties where you paid $25 to go and took your suitcase. During the evening a name was picked and that person and a friend left for the airport for a three day weekend all expenses paid. The remaining people stayed on and partied, so everyone was a winner! I never got to go on one of those trips but I told my family about them many times. For a birthday surprise my daughter packed my bag, friends took my husband and I to the airport and I didn't know until we got on the plane that we were going to Madrid for the weekend. What fun and a great tick off my bucket list! Martha your comment made me remember last summer, when my friend Lori's husband arranged for their entire family to take a trip to Italy. She didn't realize until they were all at the airport that her passport had expired! She got a new one in two days and joined them for a wonderful trip! My favorite birthday gift to date I received last year for my 60th birthday. My husband bought me a sit-down quilting machine - a Babylock Tiara. I love it and use it a lot. Great gift, good for your DH! Like Joyce above, I got a new great nephew Dylan, for my birthday 2 years ago. One other favorite gift was a gold signet rings(remember those?) that my boyfriend bought me and had it canned! Yep, that was back when stores had a canning machine with labels according to the occasion. What fun that was! I love the Tula Pink fabric. Thanks for giving me a chance to win. How generous of you Marti! Best ever??? 10 years ago my husband gave me 2 cows!!! Red Polls if you're asking!!! Melanie, the greatest gift of all! Emilou, I'm sure your Dad is pleased that you cherish that gift. Thanks for commenting, and good luck in the giveaway! Thanks Aunt Marti, and thanks for sharing on YOUR BIRTHDAY!! Happy Birthday, Aunt Marti! Love those green fabrics. One of my favorite gifts was a new grandson! Congratulations on reaching 400 posts, too. OMG Tula green fabrics - how can you part with them!? You know that I am a green gal so HAPPY BIRTHDAY and my fingers are crossed! My fav birthday pressi would have been a painted rock from my nice. I still use it to this day! Happy Birthday! My favorite birthday gift so far was my fiance proposing a few days before my birthday this past year! I love that Tula Pink fabric, thanks for the giveaway! My favorite birthday gift is just spending time with those I love..doesn't get better than that! What a romantic gift! Thanks for commenting and good luck in the giveaway. My best birthday gift was a picture of my adult kids all together. I was just thinking last night that the most recent photo I have of my boys is from three years ago, before My Little Sailor joined the Navy! Thanks for commenting and good luck in the giveaway. Thank you for the giveaway, I hope this year brings you lots of joy! Happy birthday late! My favorite present is always a nice bunch of fresh flowers! If there is a dinner out too, it is a splendid birthday! I guess the most memorable Birthday was my 42nd - when my husband organised a suprise party for me - everyone brought food & cale - two "21st" cakes - we even had a Happy 21st key to sign. It's been a long time since I was married and divorced, but my ex-husband always managed to give me the gifts. A million years ago he gave me an antique Queen Anne mahogany desk which I still own and use every day. 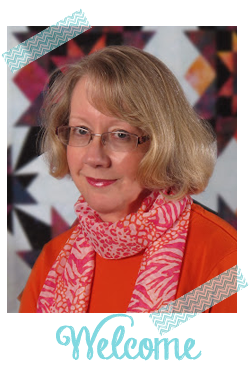 Thank you for the chance at that lovely collection of fabrics and the Tula Pink book. How lovely! I've had some great birthdays but I think the first birthday I celebrated with my "now" husband was the best. He took me and my youngest daughter to see my oldest daughter at college and spend the weekend. He gave me some jewelry but it was the thoughfullness that meant so much! Two years ago I was given a lap top and I love it!!! I have 2 favorite birthday gifts ever. The first was when my husband & I were dating and he bought me a pair of sapphire earrings that I had been eyeing. The second was last year when my husband & his mom went together & bought me a Janome 6600. I didn't expect either one and I have been thrilled with both. Thanks for the chance to win! this year my hubby surprised me early with a MacBook pro for my bday.. so I could use it for my art and online stuff. Happy Birthday, Marti! It's been a pleasure to be a scrapper with you! My favorite b day gift was for my 40th. My sisters flew home and surprised me at a party my husband threw for me. I was totally shocked! Happy birthday!! Wishing you a great year ahead. My best birthday present was for my 60th - a trip from NY to England via the Queen Mary. My most memorable gift was my first bike that I received on my 8th birthday which fell on a day with a large snowstorm so I had to ride it around the basement. Happy birthday to you! My husband got me a kitchen aid stand mixer for my 25th birthday. It is royal blue and I love it (and still use it almost weekly). Happy Birthday to you! Having lunch with my parents at one of my favorite restaurants in Munich last year. My favorite birthday gift was a Tiffany bow necklace my boyfriend gave me. The worst birthday present was a graphing calculator when I was 17 :( First world problems I suppose! Always hated birthdays, but on my thirtieth, I used my birthday as an excuse to buy a fancy bakery birthday cake. I ate the entire thing myself. Now, birthdays are the cat's pajamas. I always wanted to look inside one of those freespirit boxes before buying one. Do you like it? Would you do it again? Best birthday gift ever was my kids getting together and painting my bathroom putting in a new sink and putting down a new floor. All while they set me off to get a pedicure. It took them an entire weekend to complete the project but what a wonderful gift. My first sewing machine, a Necchi, when I turned 16. The gift that kept on giving! Thanks for commenting and good luck in the giveaway. For my 18th birthday, I got an engagement ring! Thirty-two years later, we are still going strong! Not bad for a couple of kids!! My favorite birthday present was on my 40th birthday -- my husband took me to London and we spent the day at the British Museum and Liberty of London! Fantastic day! My fav birthday present was a weekend at a lighthouse! So magical. My all-time favorite birthday gift was from my daughters, They sent me to the spa for a massage, haircut and facial. What a relaxing day. Do you think they were trying to tell me something?? I don't, Donna, I think they just thought you would enjoy the day! Thanks for commenting and good luck in the giveaway. Two Sundays ago was my birthday, I got the best gift ever.....I held my grand daughter for the first time! My heart melted. Gorgeous birthday pressies :-) My favourite birthday present - a day out with my family - away from the smog and busyness of the city. Oh my goodness! Am I ever pleased to have found you! 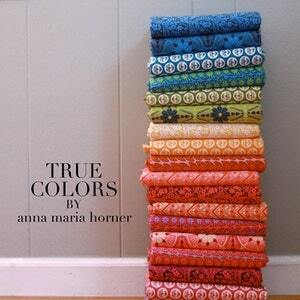 Your blog is delightful...happy birthday to you...and the Anna Maria Horner collection is FAB! The rule pink you are giving away is lovely, I have been using greens as a neutral and it has been very successful so far! Thank you for the opportunity to win something wonderful! Thank you, Carolyn! Thanks for commenting and good luck in the giveaway. That's a tough question... Hmmm... Probably the best birthday gift I've received was my set of snowshoes! I love enjoying a winter day on them :) A close second was probably receiving my first cell phone in high school, haha! What was my best birthday present ever? My husband :-D we met on my birthday and have never been apart since. Last year for my 50th birthday my brother (whose birthday is on the same day but he's 8 years older) gave me a voucher for lunch with him followed by a luxury spa treatment with all over body massage. It was a lovely day and very relaxing. What a great brother! I guess I was his birthday present 51 years ago! Thank you, Katelyn! Thanks for commenting and good luck in the giveaway. My best b-day present was the time my hubby threw me a surprise party. I'd never had a surprise party before and I had no idea it was coming. It was great. My favorite b day present was probably some barbie doll when I was little. Birthdays are none exciting in my house. 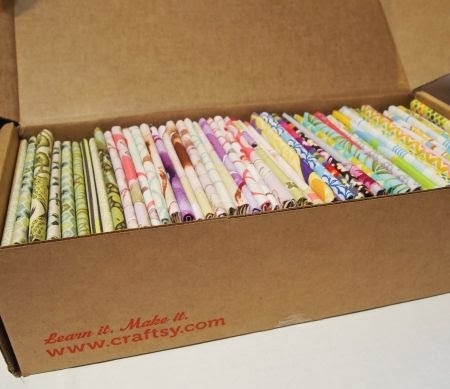 Love those fat quarters. Happy Birthday! My best birthday gift was a trip to Manhattan with a friend to celebrate our 50th birthdays. Happy Birthday! My favorite birthday gift was finding out on my 50th birthday that I was going to be a grandma for the first time. My granddaughter is 3 now with a little sister. The gift just keeps getting better! a trip to Florida when I was 10. Of course it was the family vacation and simply coinsided with my birthday, but I was gullible then and enjoyed the vacation. Happy Birthday. Love your gifts! My best gift was a surprise party my dh threw for me when I turned 50. Lots of friends, laughs and a special guest, my 3 day old grandson! Happy Birthday and congratulations on your 400th blog. I look forward to reading your blog posts. So much inspiration! My best gift is my 1951 Singer Featherweight that my husband bought for me at a garage sale. Here he was out looking for things for himself, and he finds a sewing machine and buys it for me. It is beautiful and sews wonderfully. My favorite birthday gift was a trip to Australia! Thanks for the chance. my all time favorite gift was a Mary Poppins doll. When I was young Mary Poppins had just come out and I use to have breakfast with my grandparents at the kitchen table. On the back of the Kellog's cereal box there was a coupon you could send in and a few dollars you could buy a Mary Poppins doll. Well on my birthday I came down for breakfast there was a box on the table that the mailman had delivered, and it had my name on it. I was only 5 or 6 at the time, and this was the first time mail had come for ME! I opened the parcel and inside was that Mary Poppins doll. My grandfather had ordered it for me. For my 40th birthday (many eons ago) my husband gave me a surprise birthday party and it was a surprise indeed! Loved it. What a great gift, Lynne! Thanks for commenting and good luck in the giveaway. Marti, you are so kind to offer this fabric and book to one of us!! Happy, happy birthday to you. Birthdays are best when you can share them with family and friends. That would be my best memory of a birthday. What a wonderful giveaway! My favorite present... well, it was a few days later, but it was the birth of my first child - 21 years ago. Happy belated Birthday. My best present, not too surprising, was a puppy on my 10th birthday. Had begged my parents for one and they finally relented. Have had a love affair with dogs ever since. My favorite birthday gift I have ever received is a christmas/birthday gift because my birthday is dec. 30th. It was a sewing machine. I have been making gifts like crazy ever since then. This year we have agreed not to get each other any gifts due to not being able to afford it lol. When I was a teen, my best friend gave me a raggedy ann doll because she knew I never ever owned one as a child. Thanks for the giveaway! Happy birthday and congrats on your 400th post. My favorite gift was a new Bernina 730 sewing machine from my DH that was a complete surprise. We were taking my older Bernina to be cleaned and while it was being cleaned sweet DH was buying the new one! Thanks for the chance to win your wonderful TP fabrics. You are so generous. A few years ago when I was training for a triathlon my husband surprised me with a bike computer--a very thoughtful and perfect gift. I received a pair if diamond earrings from my father on my 18th birthday. It was a very special surprise. Thank you for sharing your goodies with us. What a sweet gift from your Daddy! Thanks for commenting and good luck in the giveaway. The best birthday gift I ever received was when I was about 12. My 2 older brothers, then 20 and 24, gave me a ten speed bike! All the rage back then, and I was the first of my friends to have one. It looks as though you had an indulgent birthday! Thanks for the giveaway. 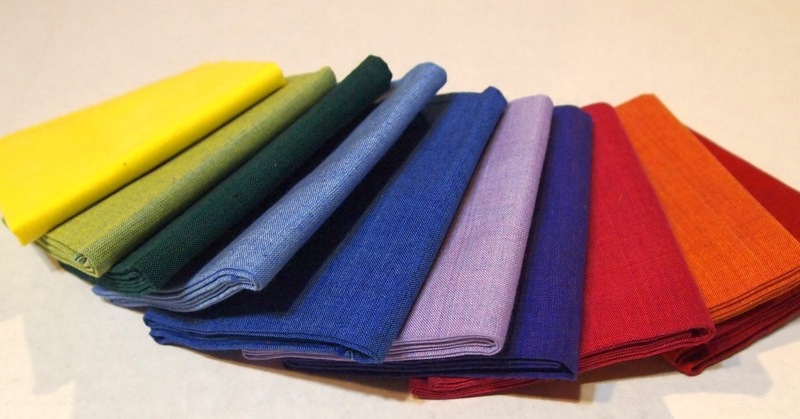 My favorite fabric related birthday present was when my mom bought me the purple/pink Joel Dewberry line a summer or two ago, and I got a serger from my husband. Best birthday gift was the year 2002. My son was in the Marine Corps and 9/11 had happened and all discharges were delayed. He had been due to be home in October and then we knew nothing. On my birthday in January...he comes walking thru the door as if it was no big deal. Could not stop hugging him for 2 days! Thanks for the giveaway and the chance to remember that sweet moment. P.S. Green is my favorite color. My best birthday gift was the birth of my nephew. Although he was born at 26 weeks when my sister developed HELLP and almost died, he is now healthy and doing great, as is his mom. The best birthday gift I ever got was my dream house. Actually, the closing just happened to fall on my birthday, but DH took advantage of it and said that was his present. He never knows what to get me. Thanks so much for the chance to win fabric from my current favorite designer. My best birthday present was a weekend at a spa. Very relaxing and really indulgent! Congrats on your birthday and the 400th post. 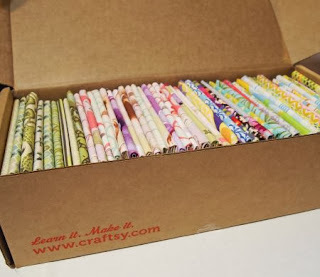 I'd love to win this Tula Pink fabric, so I'll be in the corner whispering "pick me, pick me". That was a gift from someone who really knows how to gift! Thanks for commenting and good luck in the giveaway. The best birthday gift ever was the diamond engagement ring from my then boyfriend, now the best husband ever. When I was 4 years old I got a folding wooden beach chair and a beach towel, both rainbow striped. The towel is long gone, but I still have the chair! The best present I ever got was a little pink flowered bracelet from my grandma. We both had birthdays in early January and she knew what it was like to have a birthday after Christmas. Sure wish I knew where the bracelet was now. The birthday present th.at sticks out in my mind id when i was 12 years old and i got a telegram from my dad! He was out of town on business and couldn't be home for my birthday! Happy late birthday! My very favorite birthday gift was my late Yorkie, General. He was a pistol! I have never been given anything that I loved any more than that little fellow. Birthday in December ~ the best is yet to come! Just thankful to be functioning and enjoying all the beautiful fabrics and quilting. Happy Birthday! My favorite birthday was 12...I was in 6th grade and wanted a "Stingray bike" complete with the high "sissy bar" and "diamond" pillow!! My maiden, great aunt Mary gifted it to me, her namesake. I don't think any of my siblings ever got such a gift from her or anyone else in the family. It was a real treasure! Wish I could have known "GAM" (Great Aunt Mary) when I was an adult, but we lost her before I had the sense to know what a real treasure she was! Now that I am the "GAM" in the family, I try to know my great nieces & nephews a bit better. Haven't taken to signing cards and letters in her fashion tho.. Happy 400th and happy birthday! My favourite birthday gifts is going to be the Bailey's 17" sewing machine I am going to buy myself tomorrow! Thank you for the generous giveaway! !